Location: North 68:59.726, East 018:13.619 (GPS at the summit). 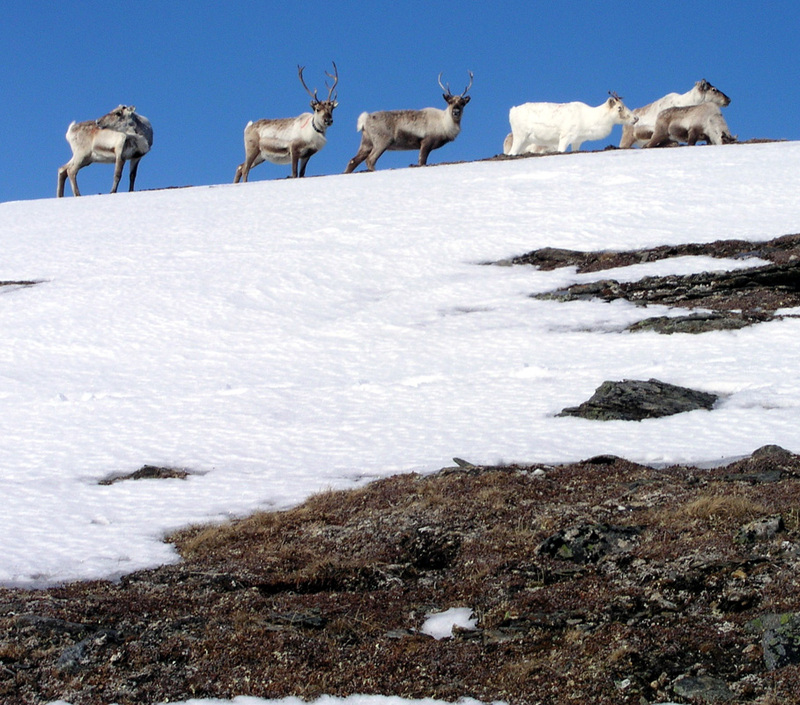 How to get there: From Tromsø, head south along Hwy. E8, then E6 to the village of Bardufoss. This is about 134 kilometer. Drive approximately 15 km west on Hwy. 86 from the center of Barduofoss, on the north side of Andsvatnet (158m). After the road has started descending, locate a side road that goes left. 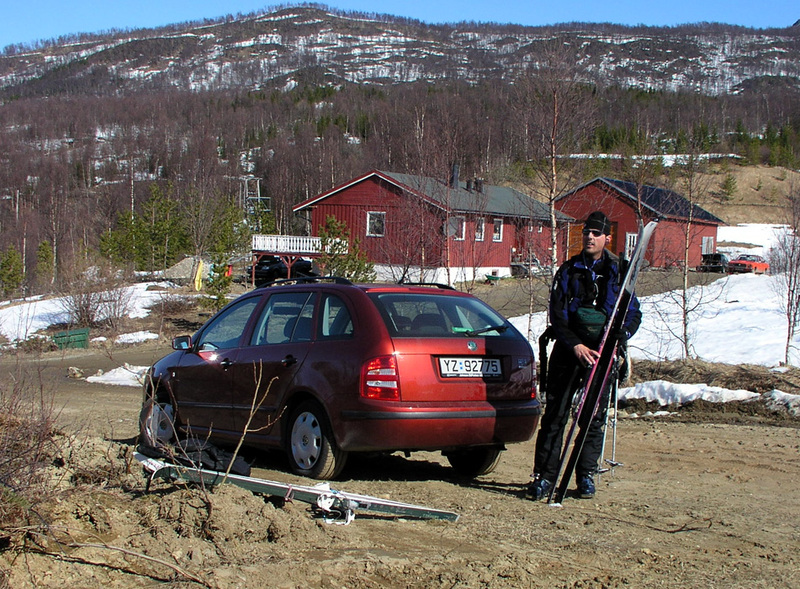 The sign says Rabbås 3km. Take this road and continue 3.4 km. This is near the end of the road, there is a gate there and what appears to be a small junkyard for old cars. Park on the side before the gate, do not block access. This is the trailhead, elevation 165 meter, north 69:03.647, east 018:11.944. 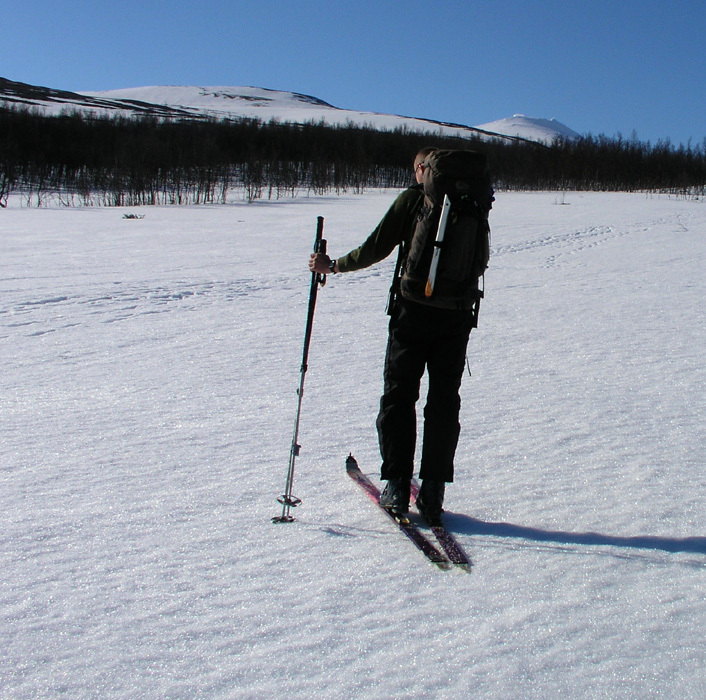 Route description: From the trailhead, ski directly up the very broad and gentle ridge among birch trees. The trees are well spaced and there are large open areas in between so the vegetation causes no problem for this route. Higher up, exit from the trees and continue in the same general direction. 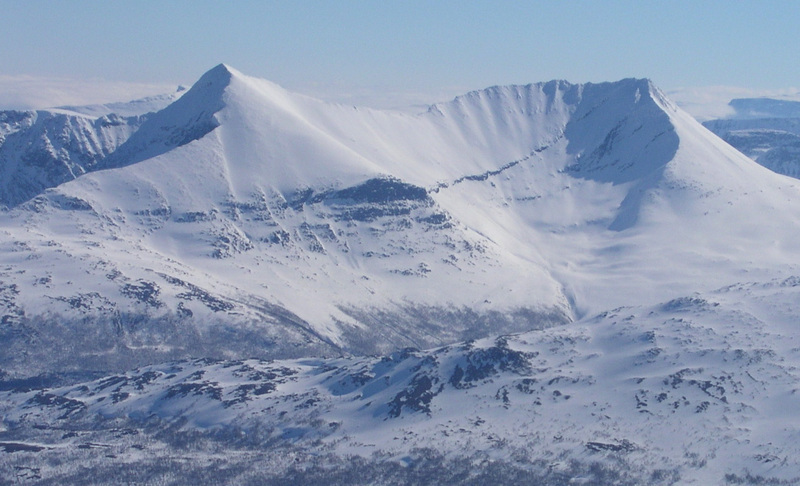 As you get above 700 meter, keep the course a bit west of Veidfjellet (871m) and contour into the saddle area between Veidfjellet and Hjerttindtuva (1080m). Proceed south up the broad and gentle ridge leading to Hjerttindtuva. 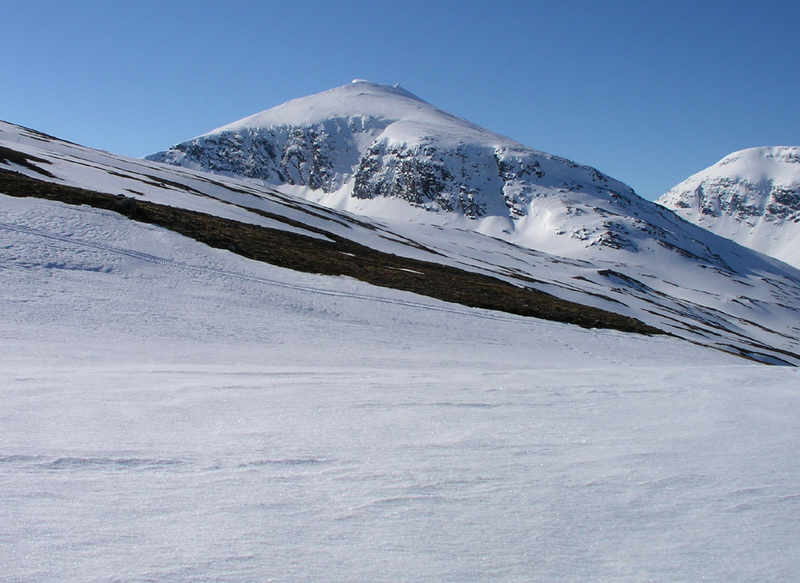 Stay slightly east of point 965 and contour into the saddle just below Hjerttindtuva. 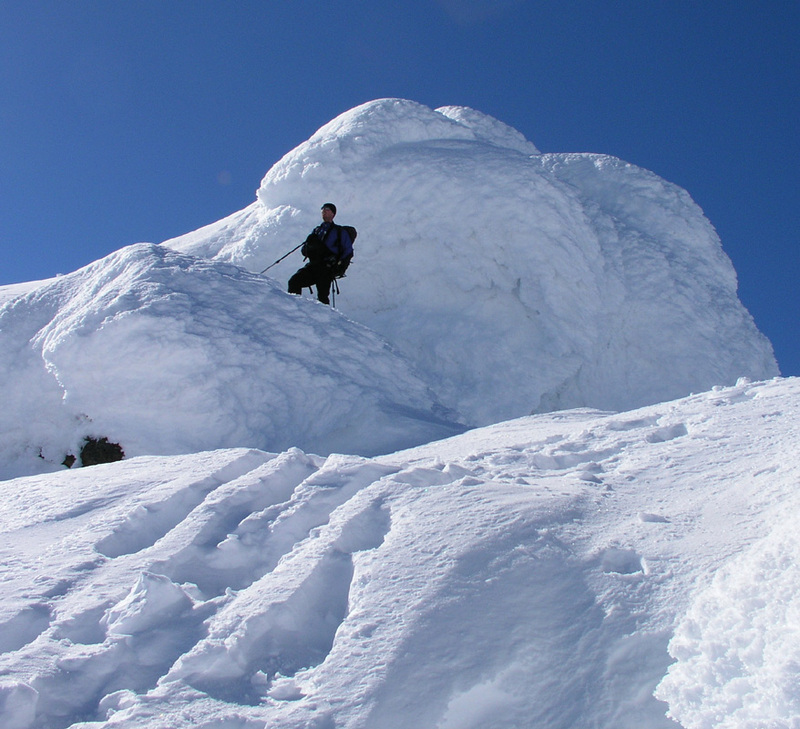 Continue up a bit steeper to an area with big boulders. 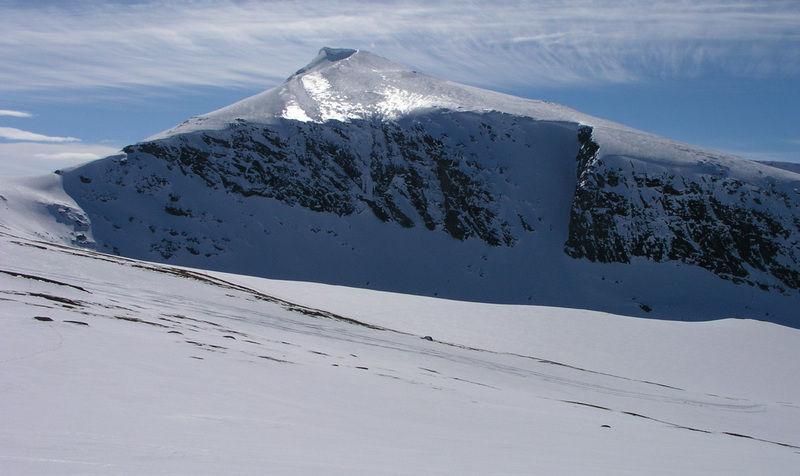 At this elevation, 1016 meter, one can easily contour around to the right (west) and proceed to ski down into the saddle between Hjertttindtuva and Hjerttinden as soon as the slope into this saddle is free from cliffs. 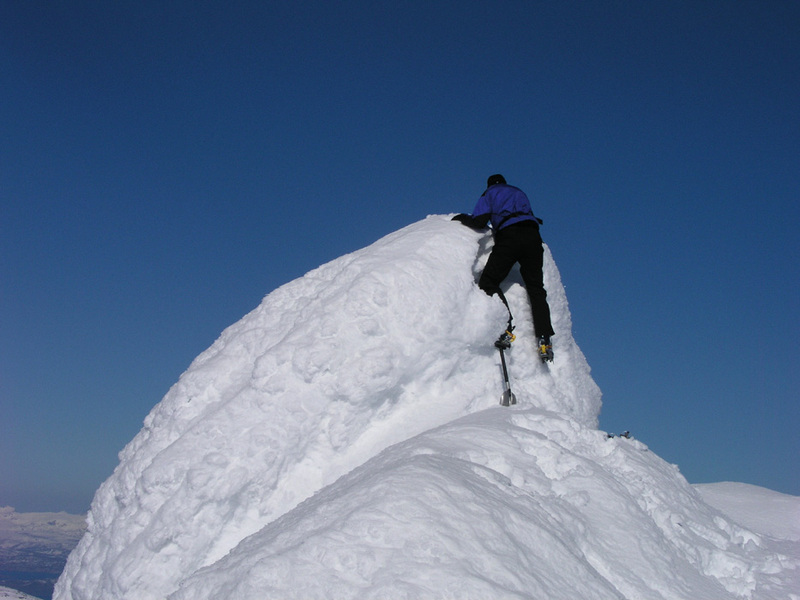 Alternatively, one can proceed up and across the summit of Hjerttindtuva before descending into the saddle. 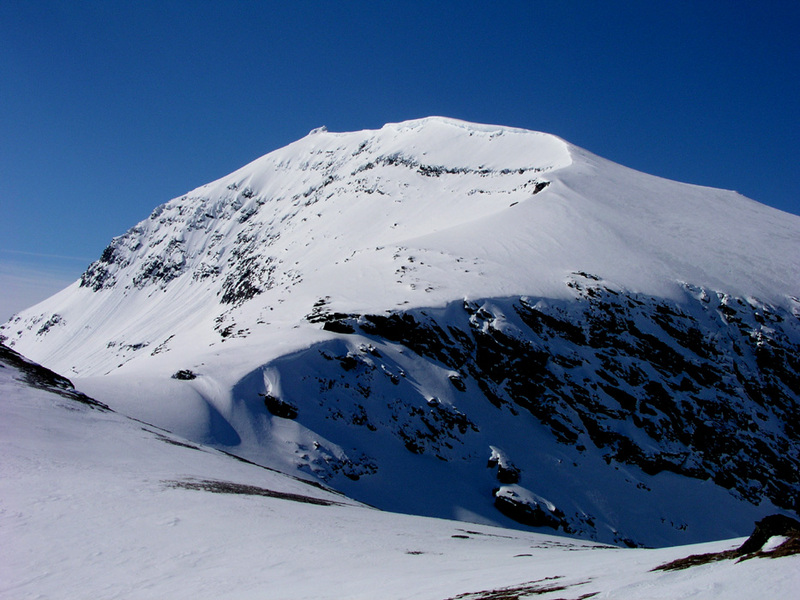 Most climbers will likely do both variations in order to also visit Hjerttindtuva. 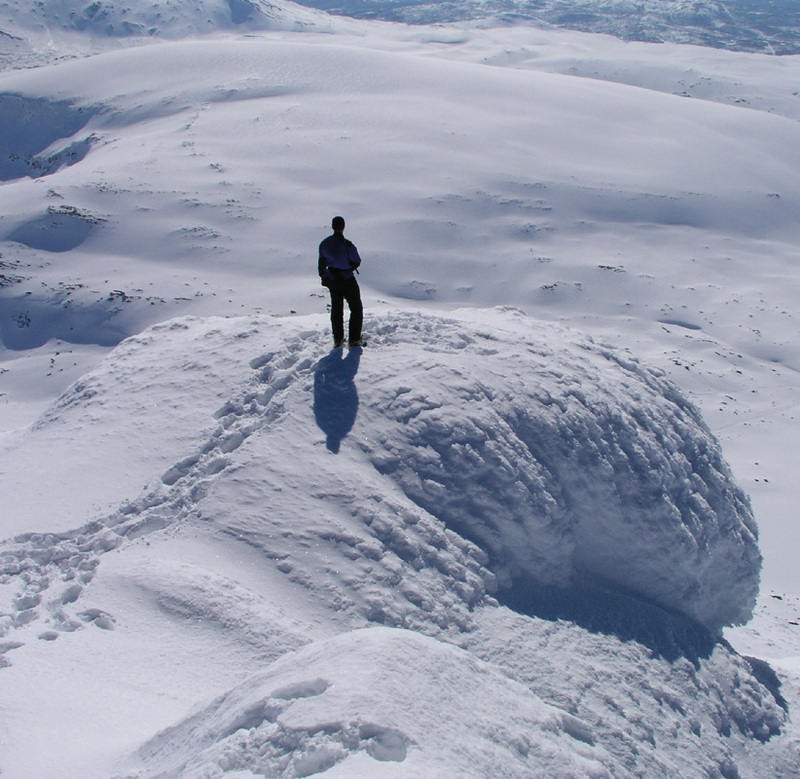 From the saddle, the ridge to Hjerttinden is easy to follow. 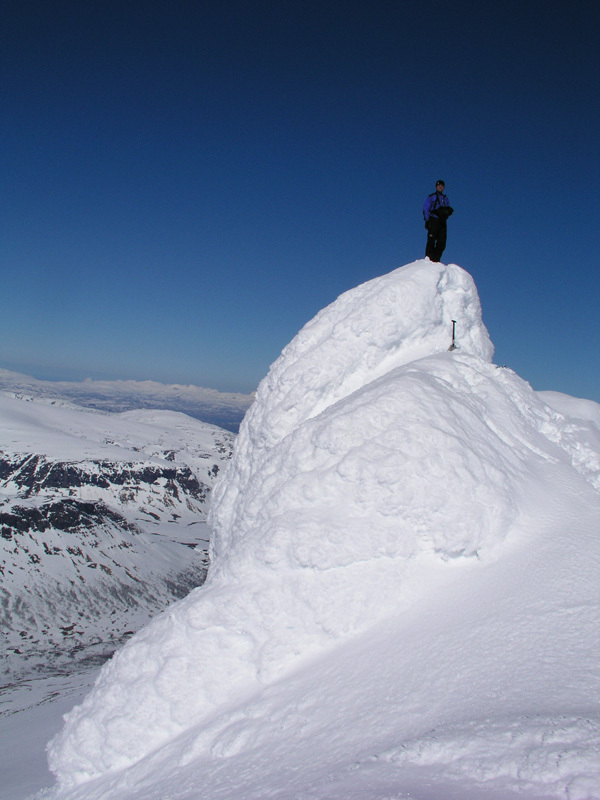 It does have cornices most of the way so keep a safe distance. The slope is never steep and soon you will have the summit block in view. 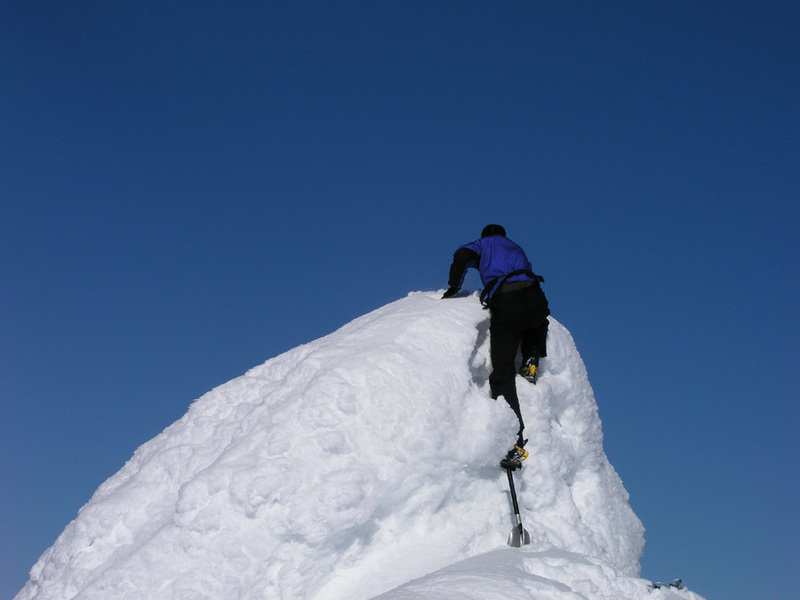 The final climb is not for skis. 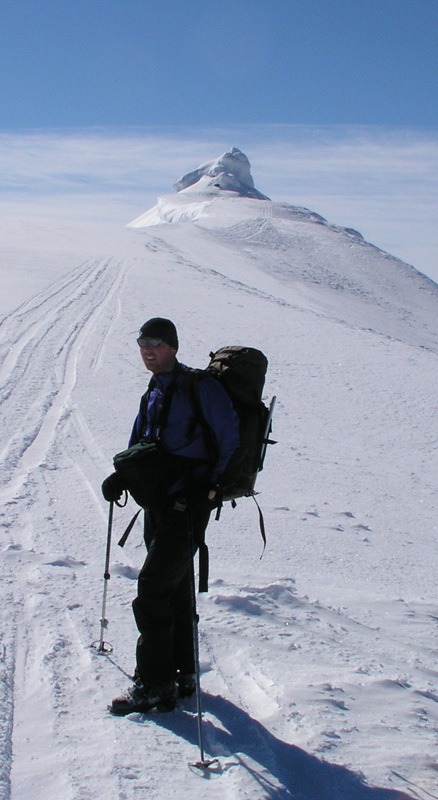 Leave them and consider using an ice axe for safety and crampons if the snow is icy. The direct route climbs up slightly on the left side and is well protected. Actually, the easiest route is likely to proceed around the summit block on the right, then ascend it from the south. Comments: I did this climb with my friend Ståle Grimen. This was his first T5 peak and the weather was perfect. We started skiing at 0745 and made the summit at 1145, 4 hours in very good weather and views that just got better as we gained more elevation. We visited Hjerttindtuva on the way up. We stayed a full hour on the summit, Ståle was already starting to believe that priority should indeed be given to peaks with high primary factor. Leaving at 1245, we were back at the car at 1400, 1:15 of fun skiing with very predictable conditions. This was peak number 3 in my T5 trip. Next peak Blåtindan. 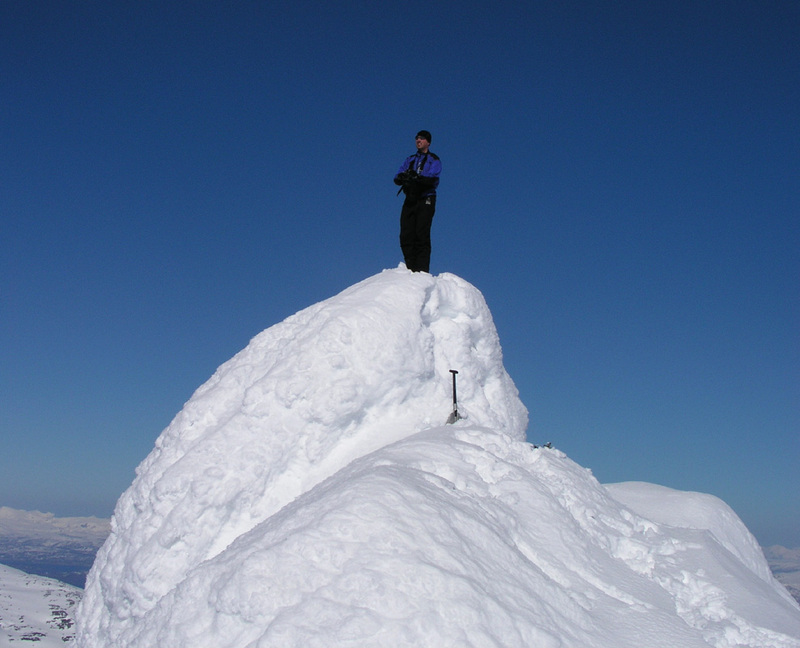 Previous peak Rasmustind. Hjerttinden, as seen from the small road leading to the trailhead. Ståle, starting on his first T5 ascent. Hjerttinden, as seen from the base of Hjerttindtuva. The summit block is very distinct. 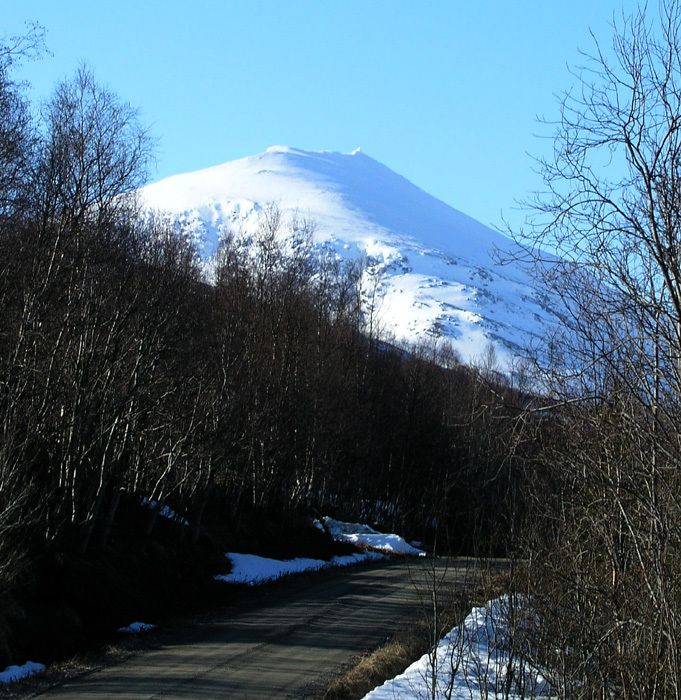 Istindan, a characteristic twin peak. 360 degree summit panorama I. 360 degree summit panorama II. 360 degree summit panorama III. 360 degree summit panorama IV. A farewell look while descending.